In response to emails of concern about our safety, I thought I’d give you an update of our situation today. I’m sure news reports of this storm will be widespread given the strength and size of this very scary storm approaching our coast today. Hurricane Matthew will arrive closest to Florida’s east coast about 2 A.M. Eastern time tomorrow morning (Friday), as a Category 4 (winds at 130-156 mph, 113-136 kt, 209-251 km/h) and possibly Category 5 storm. For reference both Hurricane Andrew in 1992 and Hurricane Katrina of 2005 were Category 5 on the Saffir-Simpson Hurricane Wind Scale. Unfortunately the current projected path of “the most powerful storm to threaten the Atlantic coast in more than a decade” puts it going all the way up the state’s East coast for about 24 hours when it reaches Georgia and South Carolina where it is projected to go further offshore (and then loop around, destination unknown … ). 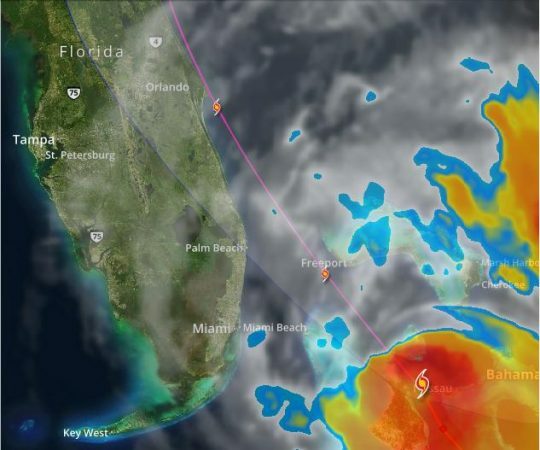 Matthew’s nearest approach to the state is not far north of where we live in South Florida on the east coast and the sheer enormous diameter of the system puts much of the state in a high state of alert, anxiety and preparation. The most recent advisory at 11 A.M. this morning (below) has the storm path move fractionally EAST. We are praying hard for more of the same as the day goes on because if the eye moves further away from the coast it takes the most damaging winds with it. Hurricane Matthew’s projected path from the National Weather Service and the National Hurricane Center, as of 11 AM Eastern 10/06/2016. FORTUNATELY for us, by sheer good fortune we left Florida last weekend for our much planned-in-advance annual drive north to Ontario, Canada to visit my family. While we are thankfully out of harm’s way, we have no way of knowing what will become of our home. It is well secured with good hurricane shutters but the area is surrounded by many large oak trees so we are keeping our fingers and toes crossed that there is minimal damage. Given the strength of the storm, that could be wishful thinking. Courtesy of Robert’s research, this is a live radar screen capture from 11:30 A.M. today. He tells me this could be the first October landfall of a hurricane on Florida’s East coast since Hurricane King in October 1950. Our thoughts and prayers are with everyone in the State and along the Atlantic coast in the path of this natural nightmare and affected by its unwelcome aftermath. Enjoy your visit to Canada and I pray your house will be OK.
My thoughts and prayers are with you and the rest of those in Matthew’s path, for your safety first and minimal property damage second. Glad you are safely north for the moment. You can be assured that many prayers will be offered today and in the days to come. Bless you and your family. Safe travels to Canada. I hope you come home to your home being intact with little to no damage. Thank you for the information, Linda. I was worried that you might be caught in the direct path of the hurricane. Here’s hoping it gives your area a clean miss. I am hoping with you that you all and your homes will stay safe. Safe travels, Linda! And a “worried for nothing” homecoming. My brother and sister-in-law live in Boca Raton, and my best friend lives just outside of Charleston. I’m praying this storm moves away from the coast. I hope your home is safe and that you can enjoy your vacation. Thank you for sending this. It is fascinating yet at the same time, realizing the horrible damage done to people, their homes, families, the land, cities, towns and businesses, all of that is quite sobering. Stay safe Linda and all ~ prayers are offered for all of you. Thanks for the information. Prayers are going out for the safety of your home and all your neighbors. My cousins are on Ft. Lauderdale and I am praying for them as well. Have a good trip and safe return to your home. Thinking of you and your family, Linda. Glad you’re out of harm’s way and hoping for a safe return to an intact house. Thinking of you, Linda, and hoping for safety. Thankful you are currently out of harm’s way … jointing others in praying for your home. Sending thoughts and prayers from Tampa. Glad you are safe and hope you come back and your home is relatively unscathed! Linda, living in a similar area to Florida, albeit on the other side of the world in Far North Australia in Townsville, Maurie and I do know how you are feeling with Cyclone Matthew bearing down on Florida. Cyclones (or Hurricanes, as they are called in USA) are the terrifying part of living in the areas we so enjoy for the balmy weather we get most of the year. We are both thinking of you and hoping all will be well with your home, at least you two are safe. We are watching the progress on our Weather Bureau site and we do wish you well and a safe return home to a safe house, standing proud and waiting for you! Thank you all so much for your kind thoughts and prayers, it is VERY, very comforting. Maybe our “group will” can keep this nasty thing moving away from the coast, that would be wonderful. Of course we are keeping a constant watch on developments and hoping for the best for everyone affected. Linda, glad you are out of harms way. My prayers are going out to all who are in the path of this hurricane. Fingers crossed, your home will still be there when you return. Sending wishes for the hurricane totally poop out and harm nothing and no one. Much love to you. Hi Linda. I am glad that you are not here in Florida right now. I live 50 miles north of Orland and I think we are getting tropical storm warnings, not hurricane. I moved to central Florida to get away after we were nailed with so many hurricanes in the early part of 2000. We moved shortly after Wilma did us in. Eight months after we moved to our NEW home, we were hit with a very unexpected tornado that caused almost $90,000.00 worth of damages. At least with the hurricanes, you kind of know in advance and can prepare. I am more concerned about my family around the coast of FL, in Orlando and here than I am about myself. My motto is if I can’t control it, I am not going to worry and stress about it. Hopefully, it will not be as bad as predicted! Stay safe up in Canada! I’m sorry to hear about all your earlier misfortunes, but I must say I like your attitude. Once you have done what you can, it makes sense to try not to worry yourself sick, although I am very sure it’s a lot more difficult to do than to say! Best of luck to you all in the path of this storm! Thanks Kathy. It seems that Everyone is fine. No one even lost electricity! We still have bands coming around but it is just windy with some rain. I’m glad that I didn’t waste my energy on worrying! I appreciate your reply to my post. ? Thinking of you in Sydney Australia – Florida is on our news constantly. We pray you all stay safe. Linda, you have all of us thinking good thoughts for you and hoping you (and your home) come through it all OK.
Prayers for safe travel, a pleasant visit and good fortune for your home. We are watching from W. Coast FL, west of Orlando. We should be ok but have been through several severe hurricanes, here as well as MMS.Prayer and preparation have so far brought us through. Best wishes. Thinking of you and wishing you a safe, smooth journey and a return home that holds minimal to no damage, perhaps only a flower pot overturned, as Mathew veers away. Take care and know you are held dear in many hearts. I’m so glad you’re safe, Linda. That hurricane could have gone in any direction. Looks like your home has missed the worst of it. I hope that when you get home you find there has been no damage. Enjoy your stay in Canada!! May your journey go safely through the storm and may the trees only flex in the wind.